Synopsis: Two teams of combatants are strategically pitted against each other in structured one on one combat until, by elimination, one of the two Kings are defeated in combat. Two Kings are selected from the gathered players. The Kings then select in alternating fashion their team members. Each team member is called up by the King's request to face the opposing player. Combat is to the death, and the victor retains his remaining health for the rest of the game. Once either King has been eliminated in combat, the game is over. Each participant will gather 100/100 health unless otherwise stated. No healing takes place in this event. No attacking the other team members outside of the one-on-one combat. The Kings may choose to fight at anytime, but risk the game if they do so. Do not engage in a duel. Single saber only. (Tempo and other restrictions may be enforced by the leader of the event. Stay on the mat, or in the designated area during the combat. If you defeat your opponent, bow to the corpse and clean it up. Report remaining health to your King via private message. Sit in the designated spot if you die and come back into the area. An event where there is one specific Daimyo leading a pack of Samurai, who is targeted by a group of Ninja assassins. Get 100(hp)/100(armor) and get in a straight line in front of the event organizer. Refrain from speaking or moving around unless Needed. The Daimyo stands in front of the line and chooses their Samurai. The Samurai should always outnumber Ninja. Once Teams Are chosen, make sure you have the appropriate skins and fall in with your team. [For this event, ninjas will have a starting point. Samurai fall in with the Daimyo and await orders. Once Teams have fallen in, use this time to build a strategy. While Daimyo gives orders, Ninjas should devise a plan. Work together and accomplish your task. learn to communicate with each other. Once Both Teams Are ready, wait for the organizer's signal to start. otherwise be patient and allow both sides to be fully ready. If you die, join spectate and wait until the event is over before you rejoin. Kicking happens in combat, although if you kick too much you will be repremanded and subject to ejection from event. May draw their weapon or attack at Any time, but may also command their Samurai for their protection. The Daimyo is in charge of giving orders to the Samurai. the Samurai in turn must fully obey the orders at any given time. A Samurai Must Stay Loyal to their Retainer. Each Round, the players must rotate the Daimyo, and each should take the roll before a player does it twice. In the end, if all Samurai Fall, the Daimyo may fight to to the bitter end, or surrender. If you are chosen to be a bodyguard, your main job is to obey the orders of your Daimyo. Remember that you are Not hunting Ninjas, you are Protecting the Daimyo. Hi's life is important, not yours. Samurai Cannot use Grapple, Force, or Spam. May not use Force or Spam. An event where there is one specific Shogun (Unarmed)traveling with a pack of Samurai bodyguards, who is targeted by a group of Ninja assassins. If you die join spectate, and wait until the event is over before you rejoin. The Shogun does Not engage in combat under any circumstance. He must put his faith in the hands of his chosen protectors. The Shogun may use his Samurai any way he sees fit. The Samurai in turn must fully obey his orders at any giving time. Samurai Must Stay Loyal to their Retainer. Each Round, the players must rotate the Shogun, and each should take the role before a player does it twice. In the end, if all Samurai Fall, the Shogun MUST admit defeat and die a honorable death by Seppuku. they must kneel(/amkneel in console) before the ninja and allow them to be beheaded. If you are chosen to be a bodyguard, your main job is to protect and obey the orders of the Shogun. Remember that you are Not hunting Ninjas, you are Protecting the Shogun. His life is important, not yours. No matter that the Shogun asks of you, you must obey. Similar to normal Dueling, but with the added goal of making it look "Epic". Use the Map for Greater Tactical Advantage. Attack Once, then Change the Location. The Ninja - The Runner. Trying to provoke the Samurai to attack. The Samurai - The Hunter. Trying to kill the Ninja. A type of dueling that focuses on a 'one cut kills' philosophy. For an explanation of the method for Kendo spars, please listen to this clip of Red Dawn. WALK forward to cut range. Stand back up and WALK back to combat range. When a lethal cut lands. STOP SPARRING. WALK back to combat range with sabers up. WALK back to combat range. This is a one cut kills philosophy. The duel should be fought with timed precision movement and control. The aim is not to continually cut into your opponent, but rather deliver that one beautiful cut to end the duel. The duel does not go on passed the first cut that (in real life) would kill. A cut that takes damage in a way that would be lethal is the end game. Once a cut like this lands, you will immediately stop the duel and severe it. No Fanning, Poking, or Wiggling. Do not kill your opponent. Follow the Method every time. Get 100(hp)/100(armor) and fall in a straight line in front of the person running the event (we'll call Captin). Refrain from speaking or moving around unless Needed. NO force. NO grapple. NO kicking. No Spam. No jetpacks. Combat Begins on the Organizer's Signal. Some rules subject to change depending on location or captins desicion. "Military formation is like water -- the form of water is to avoid the high and go to the low, the form of a military force is to avoid the full and attack the empty; the flow of water is determined by the earth, the victory of a military force is determined by the opponent. Synopsis: A team of five face a singular warrior in one on one, dynamically changing combat. *This event requires no more or less than six people to participate at one time. *Each participant will need 100/100 health. * The Machine - Defeat one participant in the designated area without dying. * The Challenger - Utilize the support team to defeat the Machine without risking your life in the process. * The Support Team - Be always ready to trade places with the challenger and engage the Machine. While waiting, keep aware and focused, do not go AFK, or you will very likely be killed. Method: Four participants take up posts on the corners of the mat or designated area. The challenger and Machine step into the area. Without going into a duel, the challenger and Machine engage in the spar. At any point in the match, the challenger can and (should) tag out to another combatant who will take their place and continue the match with the Machine. End Game: If either the Machine dies, or a challenger on the mat dies, the game is over. If the Machine kills someone off the mat, the game will continue. Requirements: 3 players and Rodian Hunting Grounds Map. 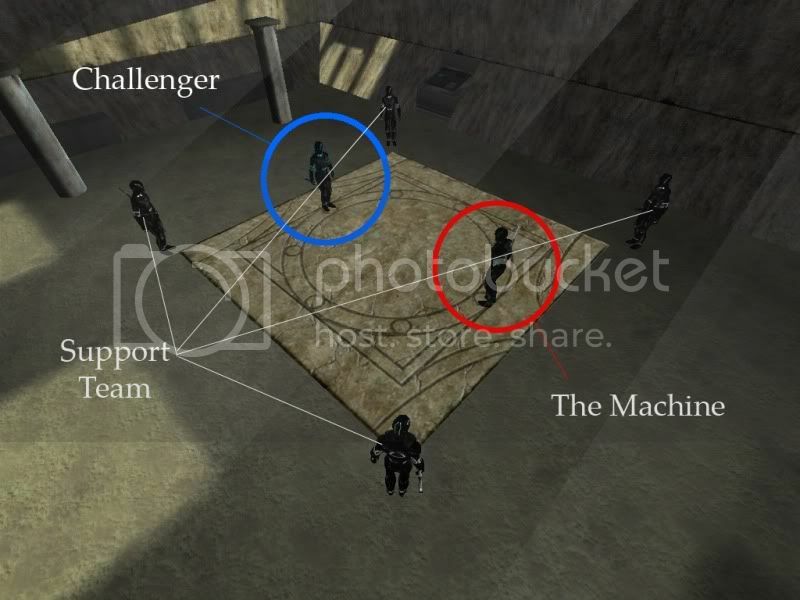 1 player is the Mark (target), 1 player is the Defender and 1 player is the Assassin. Objective: The Mark must survive the walk from the starting point to the safe zone. Defender: As the defender your goal is to prevent the assassination of your client during his/her walk to the safe zone. You may only use your sword and your wit to achieve this. Assassin: As the assassin your goal is to end the existence of your mark. You are a killer, you may use grapple hook and cloak*. No force and no jetpack. *You must uncloak before you attack. Mark: You must be in melee the whole time. You do not need a weapon because you hired the best bodyguard money can buy, you have faith. You must walk the whole time also. No running, jumping, grapple hook, force or cloak. You are allowed to fight back as long as it is in melee. And be careful, if you die before you reach the safe zone, the assassin wins. Keep in mind, if you are the Mark you will never win. The game is between the Defender and the Assassin. Defender: If the Mark makes it to the safe zone alive you win. You do not need to be alive to win the game. Assassin: Kill the mark, he/she dies you win. You also do not need to be alive to win. Organizers holding the event will set the path for the walk of faith and should be the Mark. 1. Bow to your Taun Taun's as well as your opponent's before you mount. 3. Once both sides are ready, the person in charge of the Joust will give you a Signal On this signal make one pass and then stop at the opposite starting position. Repeat. 4. if your taun taun dies you may continue but you must continue from starting positions and wait for the signal. Your Taun-Taun only die if you are not in a duel, therefore this can only happen in war jousting.